I’ve never been one of those people who work x-number of hours in the studio every day. I’d like to be but I’m not. With envy I imagine those regular-studio-hours people as having impeccable exercise regimes, and eating healthy meals at the same time each day. Laundry-is-done-on-Saturday type of people. Not me. I’m more prone to activity binges. All studio for several weeks, followed by 2 days of website updating, followed by a stretch of solid gardening is more my style; it balances out over time. I’ve been in a phase of house projects, house guests, a trip up to Canada for a family reunion… so it feels like ages since I’ve had concentrated time in the studio. Before leaving for Canada I reorganized the studio, moved furniture around, tidied up. Now I’m excited to get in there and to make some new pieces. I have a little pile of envelope backs with doodles of earrings and pendants and I need to make them to find out if the designs work. 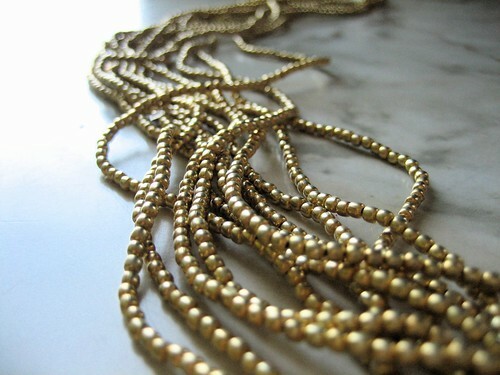 I just sent out some special order earrings, requested to match this long necklace. 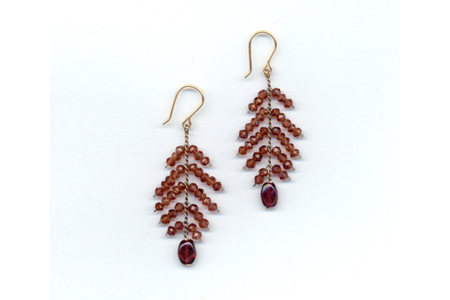 I like making jewelry to order; very often the piece ends up being something I make again. This time I made a longer pair of Square Earrings, without the drops at the bottom. I like the way they came out. 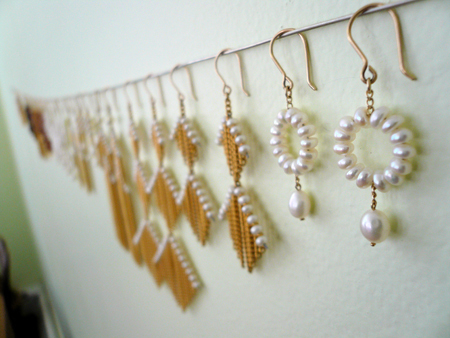 They would look great worn with hair up, the length accentuating the neck. I’m back from my first wholesale show. The Buyers Market was very quiet this year, not surprisingly, and long-time attendees felt the difference. Since it was my first show I had nothing to compare to, and plenty to take in and learn. My pal Val flew in from Michigan to help me. Hallelujah! Load in was smooth, and my booth was near the loading dock which made schlepping a lot easier. Plus we had a full 24 hours before the opening of the show so there was time to futz with the display and remember to eat and sleep. Here I am in the booth with my “I hate to have my picture taken” face on. I met lots of wonderful artists and buyers and got great responses to my work. People brought their faces right up to the cases, and wanted to touch the jewelry and see how it moves. The most used word after “beautiful” was “different”, which is a HUGE compliment. I feel encouraged and surprised by how strongly people reacted. Especially to the sculptural pieces, which were the most noticed. How fun for me – this means I get to make more. M came and helped me pack and load out and drove us safely home with the help of his new GPS toy (which I nicknamed Jimmy). I’m so grateful. I was so tired that I might have ended up in Florida if left to my own devices. 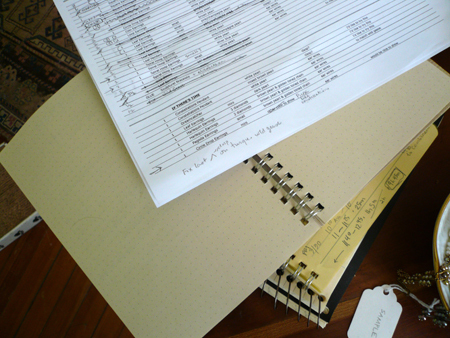 The store at the Museum of Art & Design (formerly the Craft Museum) placed an order, which is what I’m working on now. I’m excited to have my work for sale in New York, and in such a great location. Who needs to clean her house. Boy did I leave a mess. 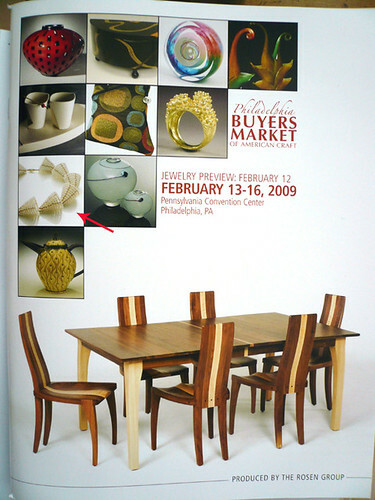 I’m getting ready for the Buyers Market of American Craft in Philadelphia next week. It’s my first trade show and it’s a biggie so I’m a headless chicken these days, running from bench to computer to hardware store. I’m all kinds of excited and nervous. This is a wholesale show so if you have a store come on down and see me, I would love to meet you (and there will be snacks). 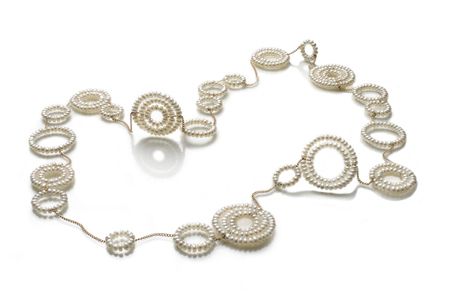 with a Jewelry Preview on Thursday February 12th from 4 to 7pm. Here’s the Buyers Market link for more information. I’ll post pictures of the booth after the show so everyone can have a little visit, if only imaginary. If any of you are going to DC for the big inaugural next week, drop by Mia Gemma. 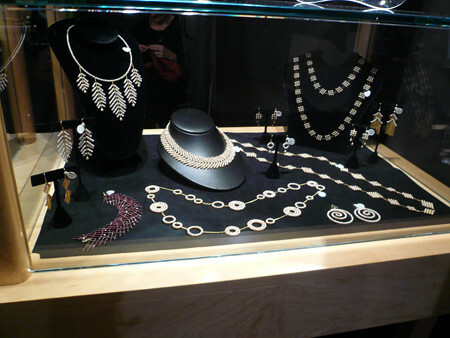 The store is just blocks from the White House and has recently added a selection of my jewelry designs to their display. 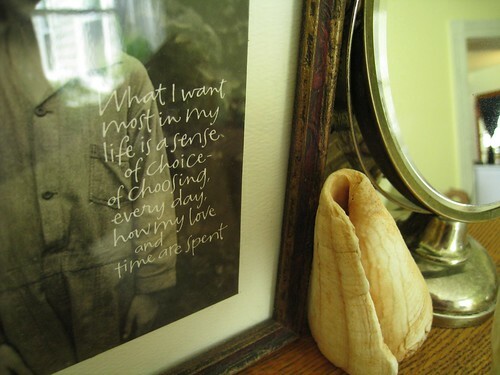 I’m excited to have my work in the store; the staff are meticulously attentive and love what they do. Go visit! It feels so much like Fall. The air is cool, with a crisp feeling to it. There’s that happy/sad feeling when I pull on a long-sleeved shirt. So it feels appropriate that I’m making little red leaves to go with this guy, soon to be winging their way to Texas. 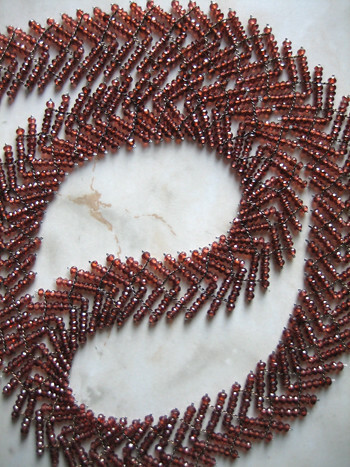 I bought a batch of cut garnet beads in December and have been pulling them out and petting them once in a while. Finally it became clear what they wanted to be and last week I made them into this necklace. I’ve always made this version of the Wild Geese necklace in a choker length, but I just kept going until all I had left was a little pinch of beads. These pictures really don’t do it justice; it’s slinky and luxurious and I’m enjoying playing with it, swishing it across the table. It makes a sound like the beach, which goes well with the heat wave we’ve been having. 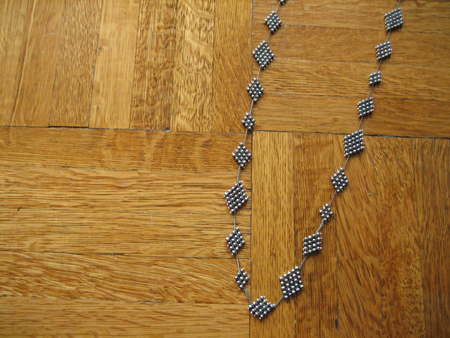 A snapshot of the necklace I’ve been working on. This might be the first time I’ve made a new design in something other than white pearls! Still pearls though. Can’t get too way out. 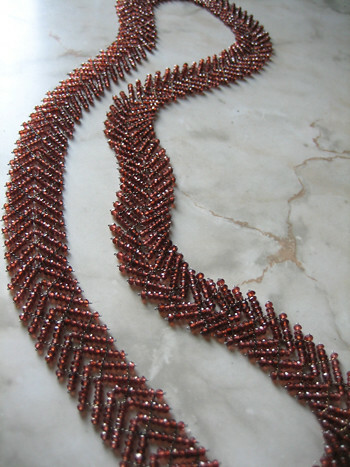 I just sent out a special order Long Squares Necklace. 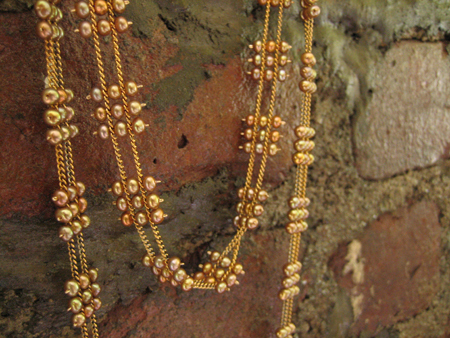 This one in goldish-pink pearls. It still seems miraculous that women I’ve never met are wearing my jewelry. I love it! It feels thrilling and mysterious. I went to the Manufacturing Jewelers & Suppliers of America show on Tuesday. It was my first time; I’m trying to network more and make use of the tremendous resources that are out there for jewelers. I went with another jeweler who works completely differently than I do. 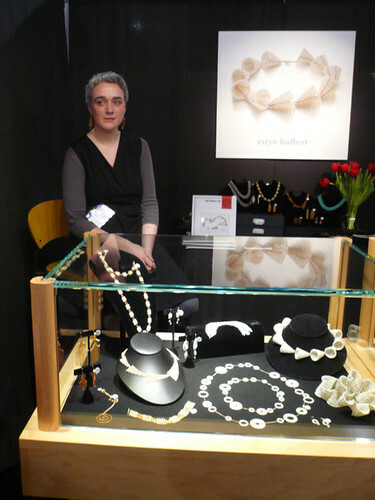 We were attracted to different booths – I stopped at bead sellers and clasp manufacturers, she talked to CAD specialists and an enameler. It was fascinating, if I’d been on my own I would have missed a lot. 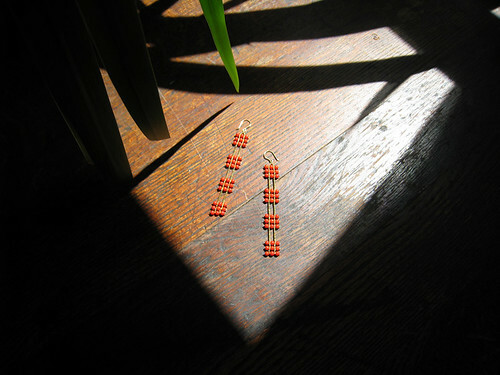 I bought some small vermeil beads. I’m not sure what I’m going to make with them but they’re the perfect size for something like a Wild Geese necklace. I’ll probably just pet them and love them for a while first though. 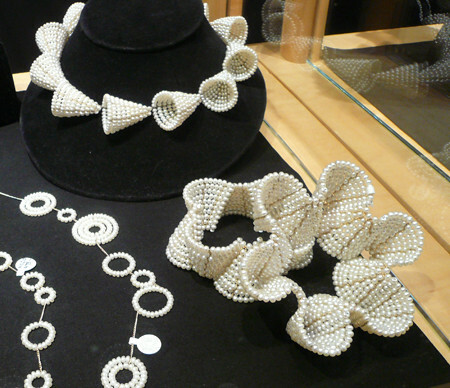 You are currently browsing the weblog archives for the 'jewelry' category.